What was once a war of five kings on Game of Thrones has transformed into, essentially, a war between two queens: Cersei Lannister and Daenerys Targaryen. But as we all know, unbeknownst to most characters, there's actually a third royal in the mix: Jon Snow, who is actually Aegon Targaryen and the rightful heir to the Iron Throne. Jon, before finding out of his true identity, had already held a royal title, when he was proclaimed King in the North - the title previously bestowed on his brother/cousin Robb Stark - after he and Sansa Stark assembled a new northern alliance and declared independence from the Iron Throne. Jon stepped away from that title and from Winterfell itself in season seven, but he's back now, so what does that mean? 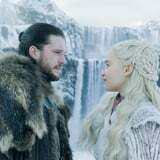 In season seven, Jon leaves the North in the hands of his (supposed) sister Sansa - who becomes the Regent and Lady of Winterfell - and journeys to meet Daenerys Targaryen, hoping to gain her support for the coming war against the White Walkers. At first, Dany is insistent that Jon bend the knee to her, but he is hesitant to give up his family's kingdom and his people's independence. Despite this, she gives him permission to mine dragonglass for weapons against the Army of the Dead. In time, Jon and Dany grow to like and respect each other (and then some! ), and he ultimately agrees to bend the knee and call her his queen, reuniting the North and the Vale with the Iron Throne under her rule. By the time Jon brings Daenerys and her people to Winterfell, she is his lover as well as his queen, and he has technically renounced the title of King in the North, presumably in favor of some variation on the old Stark title of Warden of the North. In season eight's premiere, we see the effects this declaration has already had on the Northerners: they're wary of a southern ruler, fiercely loyal still to House Stark above all, and growing more and more interested in being independent from the Iron Throne. They're clearly not thrilled about Jon's about-face to pledge them to Dany, and even Sansa is suspicious of the idea. As things stand, the North is still following Jon's lead and prioritizing the fight against the White Walkers. When that's over, though, who knows? It remains to be seen whether or not Dany and Jon, as a pair, can fulfill Davos's suggestion to Tyrion and Varys that they rule together and "earn" the trust of the North, but Jon's shift in priorities could have major consequences for his future and the future of the North.